A dish worthy of a pork lover’s last meal, this recipe has grown a cult following—including its own Facebook fan page. Try it and reach pork nirvana! From BBQ Makes Everything Better. The Bacon Explosion is hands down our flagship recipe. It’s been sent around the world on the Internet and has been hailed by some as the most downloaded recipe of all time. An ever-growing cult following has popped up in the form of a Facebook fan page, and we have even been cited as the inspiration behind Web sites such as ThisIsWhyYoureFat.com and BaconJew.com. Since this is the recipe that catapulted us into pop culture fame, it seems only fitting that we honor the recipe that started it all. Behold… the BACON EXPLOSION!!! STEP 1: To kick off the construction of this pork medley, you’ll need to create a bacon basket weave using approximately 1 pound of raw bacon. The number of strips used in the weave will depend on the size and type of bacon you choose to use. Oscar Mayer’s Hearty Thick Cut Bacon comes out to be a 5 x 5-inch bacon weave every time, but depending on the brand you choose, you may have to include a few more slices to create an even bacon weave. To create the weave, place 5 strips of bacon side by side. Next, fold back the second and fourth strips and lay another strip of bacon perpendicular to the first layer across the first, third, and fifth strips. Unfold the second and fourth strips back to their original position to create an over/under pattern. Next, fold back the first, third, and fifth strips and place another slice of bacon perpendicular to the first layer across the second and fourth strips. Unfold the first, third, and fifth strips to their original position. Take note of the alternating pattern that has been created. Repeat this process for the rest of the weave. STEP 2: The next step is to add a layer of barbecue seasoning on top of the bacon weave. Our original recipe calls for 1 tablespoon of Burnt Finger BBQ’s pork rub, but you can substitute any sweet or hot rub you’d like. Just make sure to use a rub that’s not overly salty. Bacon already contains a hefty dose of salt, so it’s rather easy to overseason with a sodium-heavy rub. Most grocery stores carry rubs labeled “sweet,” but the best way to test the salt content is to taste the rub. If salt dominates the flavor, then you should look for a different rub or sweeten it by combining 1 teaspoon brown sugar with 2 teaspoons rub. Once you have your rub picked out (or doctored), evenly sprinkle 1 tablespoon across the bacon weave. STEP 3: Now that the bacon is well seasoned, it’s time to add a layer of sausage. Although pressing out a patty by hand works just fine, the easiest method for creating the sausage layer is to place the bulk Italian sausage inside a gallon-sized ziplock bag. Evenly press the sausage to the edges of the bag to create a uniform patty. Remove the sausage from the bag by using scissors or a knife to cut along both side edges of the bag. Gently remove the sausage patty, keeping it intact, and place it on top of the bacon weave. If there is more than 1/2 inch of bacon showing around the edges of the sausage layer, expand the sausage layer by pressing the edges outward. Ideally, the sausage layer should be approximately 1/2 inch thick to create the pinwheel effect seen in the final product. STEP 5: Since this is a barbecue recipe, we need to add another layer of barbecue flavor. Drizzle 1/2 cup Burnt Finger BBQ sauce all over the top of the cooked bacon pieces. Just like the rub, this is an ingredient that can be chosen according to personal preference. While the Burnt Finger BBQ products are the official flavors of the Bacon Explosion, any locally available sauce will work just as well. STEP 6: Now comes the fun part. Carefully separate the back edge of the sausage layer from the bacon weave and begin rolling toward you. You want to include all layers EXCEPT the bacon weave in your roll. Try to keep the sausage as tight as possible and be sure to release any air pockets that form. Once the sausage is fully rolled up, pinch together the seam and ends to seal all the bacon goodness inside. This will also prevent the barbecue sauce from oozing out as it cooks. STEP 7: At this point you can start to see the final shape of the Bacon Explosion, but we’re missing one key item. 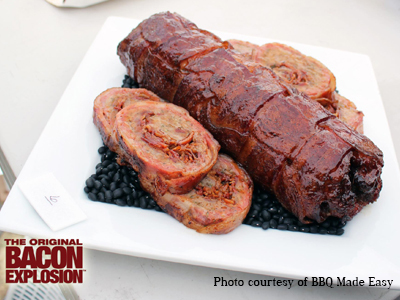 To complete the construction process, roll the sausage log forward, completely wrapping it in the bacon weave. Make sure it sits with the seam facing down so that the weight of the sausage roll will keep the bacon weave in place. STEP 8: Sprinkle 1 tablespoon Burnt Finger BBQ pork rub on the outside of the bacon weave, and now this bad boy is ready for the cooker. 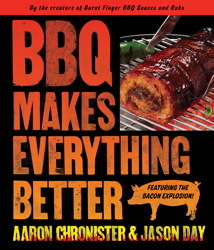 Smoke your Bacon Explosion over indirect heat at 225 degrees until the internal temperature reaches 165 degrees. Normally this will take about 1 hour for each inch of thickness, but that can vary depending on how well you maintain your fire and how many times you open the smoker to take a peek. STEP 9: Once the Bacon Explosion is fully cooked, we need to add some finishing flavors. Remember the Burnt Finger BBQ sauce that we used for inner flavor? We’ll be using that same sauce to glaze the cooked bacon weave. Using a small clean brush, coat the entire surface with a thin layer of sauce (approximately 1/2 cup). Sweet sauces are loaded with sugars, so they’ll give your Bacon Explosion a nice glossy finish. Spicy and vinegar-based sauces don’t contain as much sugar, so they won’t have that nice shiny look. To create the same effect, simply add 1 tablespoon honey to 1/2 cup sauce before glazing. STEP 10: Using a sharp knife, cut the Bacon Explosion into 1/4- to 1/2-inch slices to serve. If your roll was good and tight, you should now see a nice bacon pinwheel pattern throughout the sausage. couple Bacon Explosion slices on a warm biscuit. You’ll reach pork nirvana in no time flat!